The ultimate free Notepad replacement and a handy HTML editor. Move quickly around stacks of large files with a simple tabbed interface and format your text to your heart's content. Perform system-wide search and replacements. Strip HTML tags. Build libraries of text macros to speed up your work. Avoid tedious cut-and-paste operations -- save text clips automatically in Paste Board files. Make the most of NoteTab's options to suit your workstyle. ...... Strip HTML tags from your files. Call up complete document statistics instantly. Use powerful, system-wide search and replace tools. Speed up your work with text macros: you can use them as shortcuts, or even to auto-replace those persistent typos. Handy sample macro libraries are supplied, and you can easily build your own. Make the most of NoteTab's many options to suit your own workstyle. There's more, much more, in this package -- try the finest piece of freeware available today! 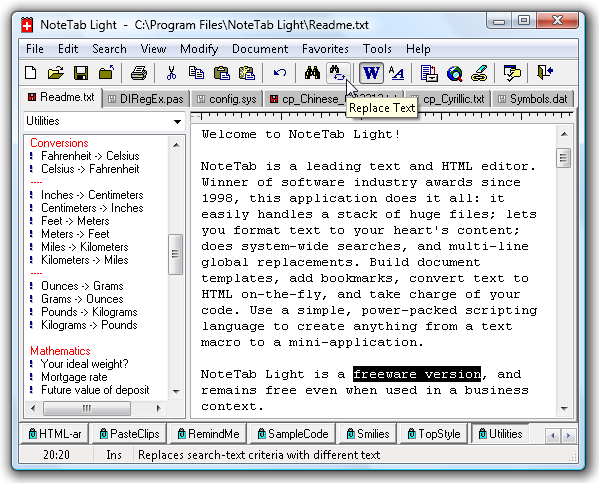 Qweas is providing links to NoteTab Light 7.01 as a courtesy, and makes no representations regarding NoteTab Light or any other applications or any information related thereto. Any questions, complaints or claims regarding this application NoteTab Light 7.01 must be directed to the appropriate software vendor. You may click the publisher link of NoteTab Light on the top of this page to get more details about the vendor.